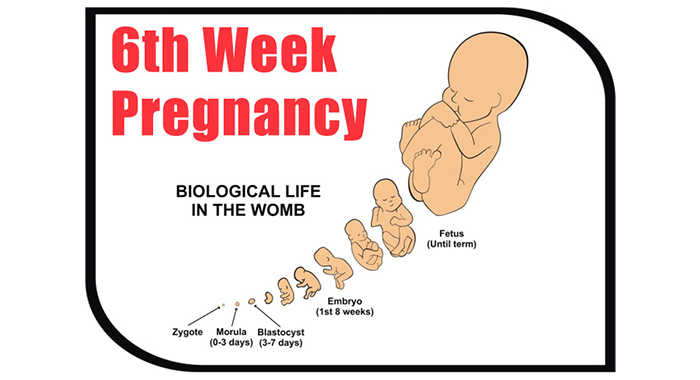 So, now you are in week six and how is the development of the little one going? By six weeks all your baby’s other vital organs will be in place. The baby inside you grows really fast, and the developments continue big time with the sixth week. Have you seen a tiny poppy seed? Your growing baby’s heart will now be the size of that of a tiny little poppy seed. Their heart is also developing from being a simple, single tube to that of a complex four chamber organ that will aid in pumping blood throughout their body. The rest of the vital organs of your baby such as lungs, liver and kidney will also be in place now. However, they may still have a lot more development left to do. The little buds which will gradually become their legs and arms are also beginning to develop. You might experience a touch ‘hormonal’ by the sixth week. Moreover, your morning sickness, fatigue and other general feelings of weariness might have literally kicked in. Now is the time to actually watch your diet. You should make sure that you have foods that are healthful and energy giving. But other than that you should also see to it that you do not have foods that could be harmful to you as well as the baby. Getting lots of fresh air will also be of immense advantage to you and your baby as your pregnancy advances.Our bodies will be able to produce Vitamin D only when we get exposed to the sunlight. Hence, you have to get out and perhaps walk while the sun is bright. 1.Your baby has small webbed hands and feet which are shaped just like paddles. 2.The baby’s heart will be beating almost double as fast as yours. 3.In the sixth week, your baby’s tongue and vocal cords will also start to form. This week’s major advancements: The mouth, nose and the ears will start to take shape. If you could view into your uterus, you will be able to find a head that is oversized and dark spots where your baby’s nostrils and eyes are beginning to form. His emerging ears are characterised by small depressions on the sides of the head, and his legs and arms by the protruding buds. The baby’s heart will be beating around 100 to 160 times per minute, which is almost double as fast as yours. Moreover, the blood is starting to course through his body. His intestines are growing, and the bud of tissue that will form into his lungs will also appear. Apart from all these the pituitary gland is also forming, along with the rest of his brain, bones and muscles. As of now, your baby is just a quarter of an inch long, which is like nearly the size of a lentil. 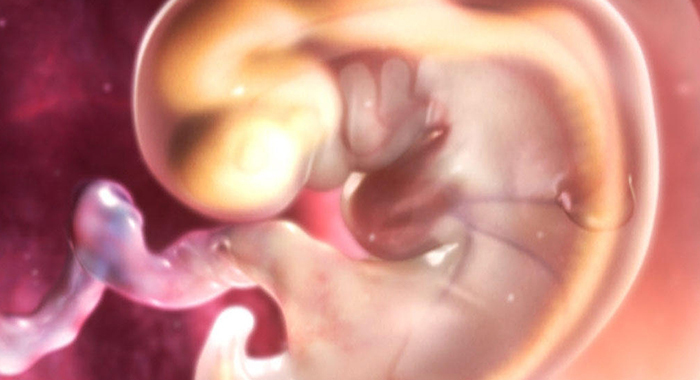 Your baby has tripled in size and is guarded by amniotic fluid. Baby’s Length: The body length would come upto around 1/8 inches. Baby’s Weight: Body weight would be less than 0.04 oz. Arm Bud: Your baby must have got those tiny hands which are shaped like paddles, along with a thick webbing between the developing fingers. You will be bale to notice the baby’s arms moving this week later. Heart bulge: The little one’s heart is beating almost twice as fast as yours and also started to divide into right and left chambers. Leg Bud: Your baby will start moving her legs later this week. Lower jaw: The tongue and vocal cords are just starting to form in the baby’s mouth. You may find yourself generating a bit of a split personality. You might feel moody one day and the next day might find yourself real happy. Ricocheting emotions are caused partly by varying hormones. Spotting or bleeding is almost common in early pregnancy, affecting up to one-fourth of the pregnant women. It may happen in a normal pregnancy, but sometimes it can be the first indication of miscarriage or an ectopic pregnancy. If you have any bleeding or spotting, you need to call your healthcare provider.